An audience in Milan first saw the new 'slimstyle' series on the 10th of April 1957. Introduced to combat the Vespa G.S. in both terms of style and performance, the T.V. was a huge leap in styling and engineering to its predecessors. The new TV featured curvey lines, the front mudguard was fixed and did not turn with the steering as all earlier models had. 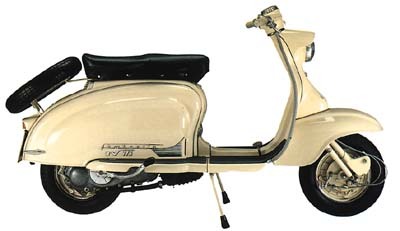 The shapley TV panels had slots at the front which helped to aid cooling, the rear passenger floor boards continued the flowing lines down towards the rear of the scooter. The rear light on the TV featured a red lens, and two round orange lenses on either side for the brake lights, The headlight unit was positioned in the same place as the earlier LD models, cast into the horn casting. A 70mph speedo was fitted as standard on handlebar casting which also housed a steering lock and key ignition switch. The brake a clutch lever supports were polished alloy, and saw a thumb wheel adjuster cast into the, for adjusting the cables. Later on supposedly for reasons of people looking at the TV one while the owner had parked and left it, people would often twiddle the adjusters, thus when the owner returned the brakes and or clutch had been altered, Innocenti stopped using the adjusters. At first, they still cast the shape of the adjuster into the handlebars, but it was solid, and then later they dropped this altogether and the casting was just smooth. Larger 10 inch wheels were fitted for increased comfort and stability, along with newly designed trailing link with internal springs front suspension, and external dampers. At the rear, a hydraulic shock absorber unit which allowed the engine to swivel on its silent blocks. The TV also saw a completely new design in engine. The power unit was now 175cc (bigger than the Vespa G.S. which was 150cc) and a claimed horsepower of of 8.6 or 9.0 (depending on who quoted the figures) gave the T.V a good turn of acceleration as well as a top speed of 64mph despite its bulk and width of the new leg shields. 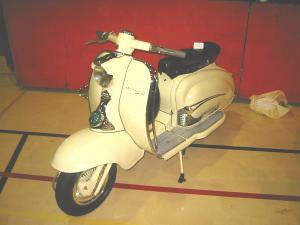 The largest carburettor ever used on a standard Lambretta was to be seen on the T.V. at 23mm and the longest stroke at 60mm. The barrel assembly now was in line with the rest of the engine, horizontal instead of the earlier upright position, and with a bore of 60mm, Innocenti had made a machine with the 'magic' square and bore configuration, preferred by the tuners of that time. Gone was the shaft drive as used on all previous models, to be replaced by a duplex chain. The cylinder faced forward, and again for the first time was horizontal. More new features included larger 3.50 * 10 wheels, gave an undreamed of handling and comfort. A new four speed gearbox, complex kick start mechanism, air intake via the the frame tube with the air filter featuring a diaphragm to smooth the air flow, and floor mats instead of 'runners' were other additions to the new range of Lambretta's. The badging on the TV wore long "Lambretta embellisher" to the bottom of the panels, and a large TV175 bolt on badge beneath, either side as well. An Innocenti crested badge, with chrome surround was in the centre of the horn casting. On the leg shields was fitted a thin chrome Lambretta badge, with the TV175 model badge beneath it, again chromed. UK models also gained a round brass badge, with the St Georges dragon on it. All body rubbers and trim were grey, along with the control cables, except for the following :- The stand feet and kick start rubber were black, the rear light body gasket was white. Production of the T.V. Series one stopped in October 1959, with 18,858 examples being made. 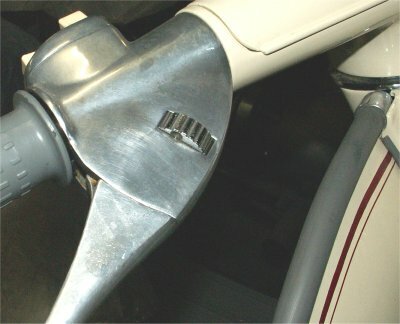 An early TV handle bar assembly with adjuster, these were were deleted on later models.